Start your Oregon adventure with us! 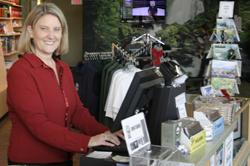 The Eugene, Cascades & Coast Adventure Center in Springfield is the region's most comprehensive visitor resource and tourist information center where you talk with local experts. Our Adventure Specialists are knowledgeable, love our area and offer insider's tips on what to see and do. Drop by, get inspired and fully equipped to explore Oregon, from mountain-top trails to coastal shores. Convenient location right off Interstate 5 with easy RV parking. Shop for books, postcards, art, apparel, children&apos;s gifts, wine, craft beer, chocolates and gourmet foods. Assemble gift baskets for arriving visitors or select made in Oregon host and hostess gifts. 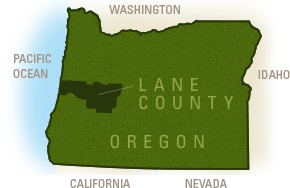 Select visitor services are also offered at 754 Olive St, Eugene, OR 97401. Maps, brochures and free Internet access is provided. Get directions, information and helpful recommendations. This convenient downtown Eugene location is open Monday 9 a.m. - 5 p.m., Tuesday - Friday 8 a.m. - 5 p.m. and closed most holidays. Do you see a big blue Bike Friday cargo bike rolling through the park? No, it&apos;s not ice cream, it&apos;s "MIKE the Bike" dishing up official Visitor Guides, maps and other helpful information in eco-friendly-style. This project is made possible by a grant from the Oregon Tourism Commission. 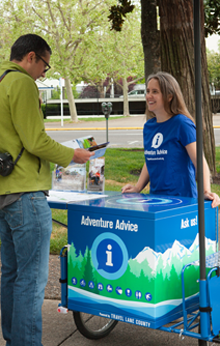 Look for our Adventure Specialists at community festivals and events throughout the Eugene, Cascades & Coast region.